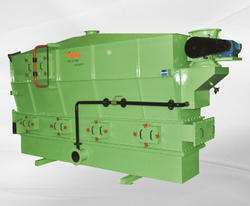 Mukesh Engineering - Manufacturer of sand coolers, co2 sand lump breakers & sand mullers in Sangli, Maharashtra. When sand come out from knock out its temperature is high. The quantity of heat to be removed depends on the sand to metal ratio and the holding time of metal in the mould. That sand sent to sand cooler through air valve for cooling. Thorough cooling is maintained by exposing the sand to water cooling pipes running the length of the sand bed. This sand drops on fin tubes where it comes direct contact with cooling tubes. Cold water is continuously circulated in fin tubes that causes heat transfer from sand to water. At the bottom bed nozzles are provided which shoots air at high pressure is supplied by a Centrifugal fan by adjustable damper valves, this cause’s heat transfer of sand also passes sand from one place to another place. Since there are no moving parts in contact with the sand, maintenance is at an absolute minimum. The unit is supplied with inspection windows, flanged discharge connection mounted on the side and adjustable exhaust damper valves for connection to a dust extraction system (optional extra), which must provide a slightly negative pressure over the fluidized sand bed. Now a days, the sand price is considerable amount while calculating the production cost per kg of casting & weight, & it also plays part during the production. Normally sand is divided in three major particles, first one is dust, second one is heavy particles and the third is useful particles whose size is between first & second. The Sand Lump Breakers are useful to break small and big sand lumps which are separated from mould box after poured casting. 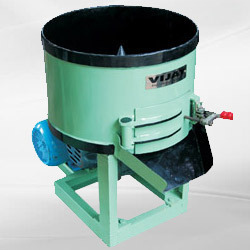 Vibratory motion breaks the lump in small particles which are screened by various screens and finally they come out in total three discharge outlet viz. dust, heavy particles and useful sand between dust & heavy particles. This reclaimed sand is useful as a backing sand to save the quantum of fresh sand used in every month. It will save production cost with minimum floor space, electric power, man power and maintenance. 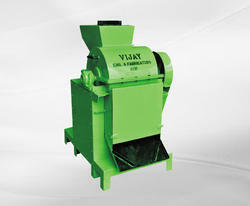 Muller’s are primarily designed for mixing green sand for Foundry application. However it finds various other applications like mixing of Abrasives, Ready-Mix plaster ,Battery Paste, Ceramics, Fertilizers, Ore, Food (with some modification) Muller’s are fitted with large mulling rollers for proper needing of the sand, as well as two sets of scrapers which move sand from center to periphery and from periphery center causing good mixing and pushing sand under the rollers. 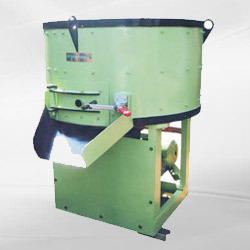 Our Core Sand Mixer are heavily constructed With suitable Motor and gearbox, For long and durable life, all Mixers are provided with Stainless Steel / Fiber Sheet Lining inside main shell, Scraper are brazed with Carbide Tips at Bottom & Side. (Note: For Chemical Bounded Sand this mixers efficiency is limited to 75-80 % of the full load capacity.) Auto Dozing is also available as per requirement. 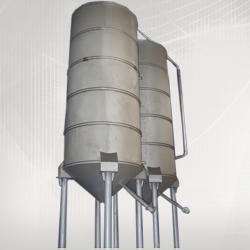 We are highly engaged in manufacturing of Core Sand Mixer Developed by using reliable raw metals and cutting-edge technology by our dexterous professionals these mixers are quality tested. In adherence to confirm quality, our sand mixers are examined on diverse standards. We provide Core/ No Bake Sand Mixers in various dimensions and sizes as per the growing requirements of our patrons. We offer our clients with an extensive range of Sand storage Hopper which is manufactured as per the quality standards of the industry. Sand storage hopper is used to store the sand in large capacity. 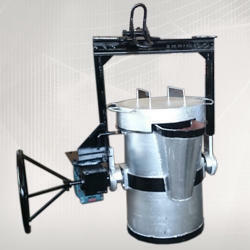 This hoppers are used for fresh sand storage, moulding sand storage, for return sand storage etc. This hopper is fabricated from MS channels, angles & plates. To avoid choking & to give the free movement the uniflow arrangement is made in the bottom of hopper also a cone shaped fabricated part is mounted on inside hopper. Which will carry the total sand load & it will guide the sand to move freely. All our industrial storage hoppers are available in different capacities and are provided to our clients as per their specific requirements. 2.A belt to carry the buckets and transmit the pull. 4.Accessories for loading the buckets or picking up the material, for receiving the discharged material, for maintaining the belt tension and for enclosing and protecting the elevator. The buckets are located in a casing or housing to contain the material. Bulk materials are loaded into each bucket as the bucket moves past an inlet point. 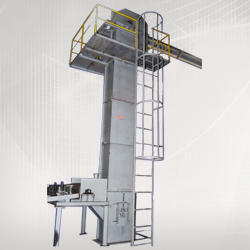 A bucket elevator can elevate a variety of bulk materials from light to heavy and from fine to large lumps. Suitable for high productivity and long plant running time. The teapot spout design, like a teapot, takes liquid from the base of the ladle and pours it out via a teapot spout. Any impurities in the molten metal will form on the top of the metal so by taking the metal from the base of the ladle, the impurities are not poured into the mould. The bail arm is strong enough to withstand heat & load for years together without any distortion. Vent holes are provided to remove gases. A locking device is provided to keep the ladle vertical during handling. 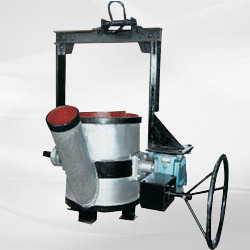 Gear box is provided for easy tilting of the ladle while pouring. Ladle can be designed as per customer requirement. For lip pour design the ladle is tilted and the molten metal pours out of the ladle like water from a pitcher. The bail arm is strong enough to withstand heat & load for years together without any distortion. Vent holes are provided to remove gases. A locking device is provided to keep the ladle vertical during handling. Gear box is provided for easy tilting of the ladle while pouring. Ladle can be designed as per customer requirement. Bottom pouring ladles are used for Steel Casting. For bottom pour ladles, a stopper rod is inserted into a tapping hole in the bottom of the ladle. To pour metal the stopper is raised vertically to allow the metal to flow out the bottom of the ladle. To stop pouring the stopper rod is inserted back into the drain hole. Any impurities in the molten metal will form on the top of the metal so by taking the metal from the base of the ladle, the impurities are not poured into the mould. The bail arm is strong enough to withstand heat & load for years together without any distortion. Vent holes are provided to remove gases. A locking device is provided to keep the ladle vertical during handling. 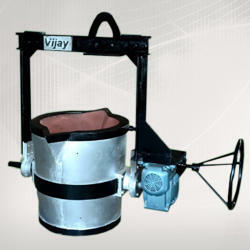 Gear box is provided for easy tilting of the ladle while pouring. Ladle can be designed as per customer requirement. A ladle used for a process to take place within the ladle to change some aspect of the molten metal. A typical example being to convert cast iron to ductile iron by the addition of various elements into the ladle. The bail arm is strong enough to withstand heat & load for years together without any distortion. Vent holes are provided to remove gases. A locking device is provided to keep the ladle vertical during handling. 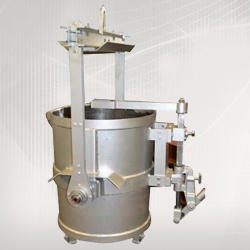 Gear box is provided for easy tilting of the ladle while pouring.